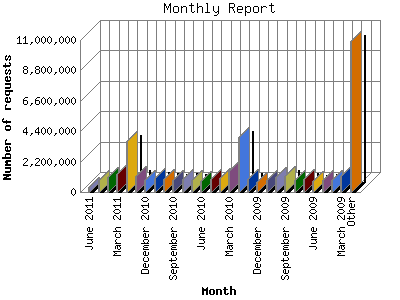 Most active month February 2011 : 3,177 pages sent. 3,982,801 requests handled. Monthly average: 2,169 pages sent. 1,029,230 requests handled. This report was generated on June 14, 2011 07:05. Report time frame January 16, 2008 02:12 to June 13, 2011 23:56.